Don't blink too much they will have their learners permits! i have a really good friend that i've been there since her babies were so young. it is amazing to see how quickly they have grown ... when i think how i could hold them in my hand when they were so so small. time flies. you have write all moments down, so you never forget a thing. video, take it all in. It's hard to believe isn't it? They are both so beautiful, Lisa. Enjoy each second. My daughter is attending Prom this weekend. It's still so unreal that she is old enough for PROM!!! Lol! @ Sunnybrook Farm's comment! That's for sure! I don't have children but have 2 dogs and can hardly believe one is 6 and the other's 7. Time sure flies. They are so handsome! I know how you feel. Yesterday my daughter was in grade school - today she's 36 and has two little girls. And me, well I'm just getting older. That is a beautiful picture of your boys! They are so handsome. My nieces and nephews grew up so fast (it seemed). Now I have great-nieces and nephews. Just think how well you've documented their lives on this blog--these pictures and stories will be precious! Well I'm really all teary now, and need a tissue. Really! Time is a thief and steals all our precious moments, the laughs, smells, and words. I know they are boys, but I just have to say it. They are beautiful. In the white caps and gowns they look like angels. You can't get more precious than his. What a handsome pair! Parenthood can be so rewarding, but it goes by much too fast. Aww, this makes me all misty eyed! Hard to believe how fast time flies, isn't it???? My boys are 50, 44 and 42 now.... GADS!!!!! Love that photo of the twins. ADORABLE. Pray for me tomorrow as I have my surgery. Do. NOT. Blink. Seriously. Mine is graduating from college next week. Seems like yesterday I was doing what you are doing. Such sweet things! And so handsome! That's how it happens. One minute they are little, the next they are grown up and going off to school, never to return. I wonder why nobody settles down near their family anymore. People used to do that. They are handsome, little guys. It really does all go so fast. Lovely portrait! Congrats to them on graduating. 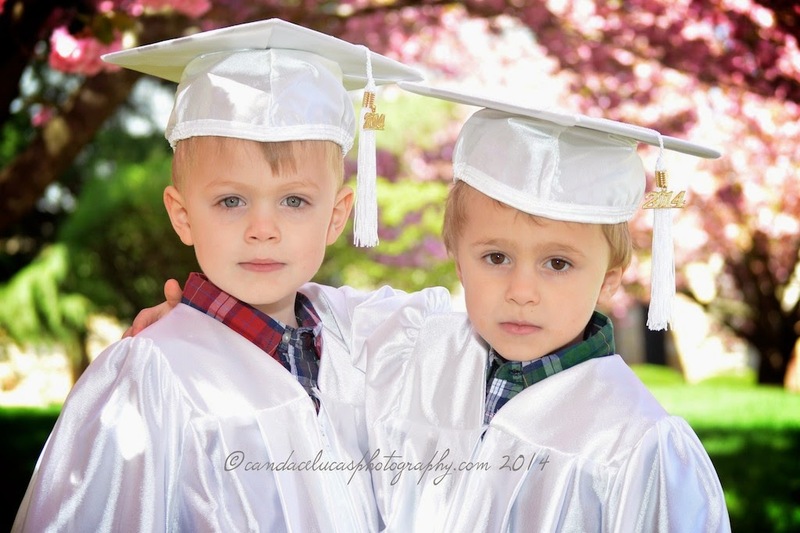 They looks so cute in their caps and gowns. You are right, don't blink. My oldest granddaughter is 14 and will start high school in the fall. Befroe we know it she will be off to college. I'm not sure where the time went. Lisa, your boys are so beautiful. I love that picture. Has it really been five years already? Ian and Eva will be going to kindergarten next year as well and I still can't wrap my mind around it! I'll no longer have babies, just big kids... Makes me a bit sad but then I think about babies and I go NOPE NOPE NOPE! Time mega flies, that's for sure. And they look so so cute!!! Awww- try not to blink Mom- it all happens so FAST!! Your boys are so adorable! The picture is beautiful! They are so handsome! They do grow up way too quickly, though! Hey, stop blinking before our kids transition from elementary school to college! I am sure you all will have great fun over the summer--lots of time until Aug and school starts. It is amazing how fast it goes….having the blog to chronicle it all is a great thing. I can only imagine how excited they are to join big brother at the big school!!! Your twin boys are gorgeous! You have done an amazing work with all your beautiful 3 children. HAPPY MOTHER'S DAY, LISA, FAMILY, BELOVED ONES! HAVE A BLESSED TIME WITH THOSE YOU LOVE, MY DEAR FRIEND! I love this photo Lisa! Now I can tell them apart better also. I used to think they were identical. They really are growing fast! I hope you enjoy your time while they are in school. They are so cute! Man kids grow up so fast! How adorable and where did the time go - I can't believe they got so big so fast. Happy Mother's Day. Such a cute picture! I love those graduation gowns. It's amazing how fast time passes by!